The Ritz Brothers go to the race track. They raise training end entrance money in a wrestling match and help a young man train the horse of his fiancée. Thelma and Patsy get jobs demonstrating washing machines in a department store window. However, on their first day on the job, they accidentally get locked in the store overnight. Gracie Alden tries to graduate on college to get an inheritance. Singing star loses his voice, recuperates in the country, meets aspiring playwright and her daughter. A would-be songwriter and a would-be inventor run a cigar stand and get mixed up in the murder of a song publisher. Possibly the least talented "act" ever seen, The Ritz Brother infested many a 30s film. Here they star in an unfunny comedy as dopes who are given a race horse. 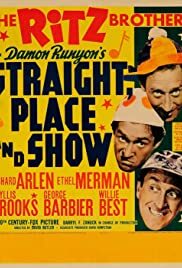 Richard Arlen and Ethel Merman are trapped in this stupid comedy as are Phyllis Brooks, Ben Weldon, Sidney Fields, Willie Best, George Barbier, and Sidney Blackmer. Ethel Merman looks great but sings two sub-par songs; Richard Arlen looks fat, and no one else cause of ripple of interest. The Ritz Brothers make the Three Stooges look like Olivier, Gielgud, and Richardson! An oddity is that Ivan Lebedev, Raphael Storm, and Gregory Gaye appear as 3 Russian jockeys.... the three also appeared together as princes/suitors to Constance Bennett in Merrily We Live that same year. What was THAT about?